Have you ever used a Gluten Home Test Kit? Home > Celiac Travel Articles > Have you ever used a Gluten Home Test Kit? 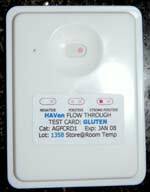 Haven Gluten Test Kits - what we've all been waiting for? May 2007: Several years after my first attempt with the Tepnel gluten kit (see below), I decided to try a bit more research to see if things in the home gluten testing world had progressed any. Out of several companies I contacted, I only heard from Haven (now Imutest), where really helpful chap dealt with my enquiry. He made it clear that their test was predominantly for food producers, but that it tested down to 10ppm - 20ppm. You can imagine my excitement. the apparent complexity of the test and plowed ahead. I wanted to test the Allergycare buckwheat flour as it makes fantastic pancakes and I needed to be sure it was 100% gluten free (or at least under 20ppm). Testing flour is easier with the Imutest (formerly Haven) gluten tester as you don't have to prepare the food sample. All in all the test took about 10 minutes, which really isn't bad, and although it was fiddly, there was nothing difficult about it. Happily, I got a negative result on the buckwheat flour, which is great news - pancakes for breakfast! 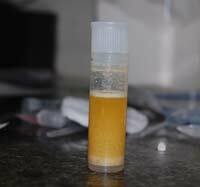 Testing more solid foods would be tricker as you need to homogenise the food sample first (i.e. bash, blend or batter it into a paste). All in all, it's a major improvement on the Tepnel test in my opinion - mostly because it tests to a reasonable gluten level. The highly helpful man at Imutest told me that they are nearly ready to launch their new 'much easier to use' gluten test kit, and when they do, they're sending me some to trial so I can tell you lovely people about it. What an exceedingly satisfactory outcome, don't you think? I was over the moon when I discovered that such a thing as a gluten home test kit existed. On my travels, I had frequently been made ill by products marked 'gluten free' and desperately needed some way to test them. Originally, this review featured only the gluten testing kit from Tepnel, which I was underwhelmed with to say the least, but in 2007 I discovered another kit made by Haven, which is reviewed above. It was slightly less exciting to find out that the test kit costs over £30 and could only be used 5 times. It only tested for 100-200ppm (200 parts per million), which is too high for my sensitivity. I got a kit and tried it out, but the LCD screen was difficult to read and I couldn't really place any confidence in the results I got, so it was back to avoiding anything that wasn't made by Orgran, whose food I have never had problems with. This was a couple of years ago, and I have just been back to look at the details of the Tepnel Home Gluten Test Kit. It looks as if the test kit has changed, and now comes with a high sensitivity 16 ppm, as well as one for higher levels of 160ppm. This sounds much better, and I think I'll order one to try it out. It's a year after I wrote the above, and I have used the Tepnel test again. This time I tested it on quinoa flakes that I know contained gluten, albeit low levels. Because I read the above about higher sensitivity I contacted TepNel twice by phone but didn't get a callback. The test didn't show anything, so I guess it just isn't sensitive enough. I assume it was set at 200ppm because that's the level set by Codex Alimentarius for acceptable gluten levels in food in the UK. Of course, it is common knowledge among coeliacs that much lower levels can make you ill. Hopefully Codex will catch up eventually. In the meantime, the search for a useful gluten free test kit continues. You can read the gluten test kit insert to get an idea how the kit works. It's definitely only 100-200ppm, so pretty useless for testing products that are meant to be gluten free. We can only wait and hope someone will spot the gap in the market and produce a home test kit that detects levels of gluten down to 10ppm. Someone has told TepNel about the review here, because I got the new version of their test kit through the post with a free kit to test. There have been marked improvements to the tester - it is now much easier to use and read, and markedly easier than the current Haven kit (we're still waiting for the new and improved Haven kit). Unfortunately, TepNel haven't improved the key feature of their git - the levels of gluten it will detect. Although Codex Alimentarius states that 200ppm is 'safe' for gluten free food, I and many other coeliacs know that is just not low enough. Overseas celiac societies such as Australia and Canada have a zero-tolerance or 5ppm approach to the 'gluten free' definition and Codex are undertaking studies to see whether their limit needs revising. (Update 2009: Thank goodness, Codex have finally seen sense and reduced the safe limit of gluten to 20ppm). So the summary for the new TepNel kit is "yes easier, yes cheaper, but if it will only detect 200ppm reliably, I don't want it even if it's free". I mean, what's the point? If you have had any experience of these gluten test kits, or any other, please let me know.